CRIMINAL lawyer Todd Ritchie criticised police who decided not to charge a security guard following a violent scuffle caught on camera outside of the Coffs Hotel on St Patrick's Day. After watching the video filmed outside of the hotel on Friday, March 17, Mr Ritchie, who said his decision to speak up was as a concerned citizen, not a lawyer, said he was very troubled by the no-charge decision. "I do not act for anyone involved in the incident and I would not normally get involved but I feel the lack of action against the security guard is very concerning," he said. The video, which went viral, shows a bouncer push a young man after words were exchanged, then hit him again. The young man, who has been charged by police, started to retaliate. A lot of comment in reaction to the video was that the bouncer had over-reacted. "I would like to think there is no favouritism at play here but in my opinion the proper approach would be for the police to charge the security guard and leave it up to the court to decide whether he is guilty or not guilty. "By not charging the security guard the police are sending a clear message to security guards in the local area.'' That message was no action would be taken, even if they may have gone overboard. Mr Ritchie, who has been a criminal lawyer for more than 20 years, said the security officer had no right to execute the "check drill'' captured in the video. Police previously addressed the media and said the security guard had acted lawfully and had wrongly been vilified. "The police say the security guard was using a check drill. A check drill is an assault and can only lawfully be used in circumstances of self-defence," Mr Ritchie said. "Section 418 of the Crimes Act outlines the principle of self-defence and basically there are two parts to it. The first being that the person must believe that it was necessary to do what they did to defend themselves and secondly what was done must be a reasonable in the circumstances. Once self-defence is properly raised in court the prosecution must prove that the accused was not acting in self-defence. "In my opinion there are no prospects of the security guard successfully arguing self-defence in relation to the initial altercation -- however that is a matter for the court to decide not the police." 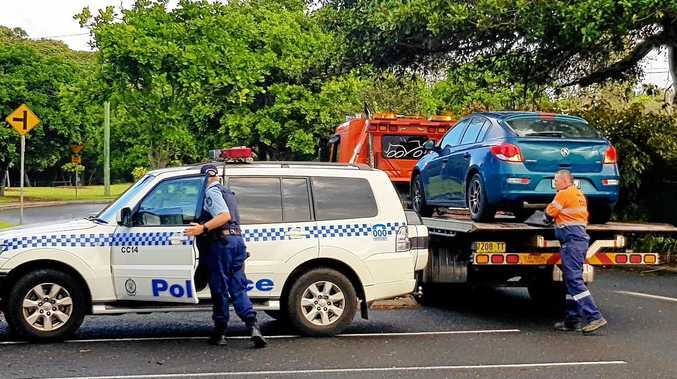 An 18-year-old man was charged with assault occasioning bodily harm, trespass and remaining in the vicinity of the premises was granted bail. He was granted bail and will appear in court on May 18.